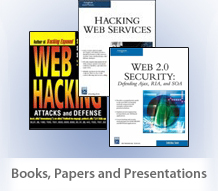 Ajax, Web Services and Rich Internet (Flash) are redefining application security scanning challenges and strategies. We are witnessing some emerging attack vectors like Cross Site Scripting with JSON, Cross Site Request Forgery with XML, WSDL scanning, XPATH injection with XML streams etc. This presentation will cover Web 2.0 attacks, new scanning tools for assessment and approaches for Web 2.0 code analysis with demonstrations. Professionals can apply knowledge in real life to secure Web 2.0 application layer.